Over the past few months, I’ve written about what to see in the night sky, how to find certain celestial objects, what tools to use, and a bit about history. In this post, we’ll explore the best places to observe the night sky. The easiest way to appreciate the masterpieces of the universe is to find the least light-polluted areas to observe from. Even with the bright lights of the cities, we can usually see our moon, and on some occasions very bright stars such as Sirius in Canis Major, Arcturus in Bootes, Betelgeuse in Orion, Canopus in Carina, and Vega in Lyra. However, bright lights will often block out all the other stars and the Milky Way. In suburban areas, lights from housing communities, sports complexes, and shopping centers may obscure the sky. That being said, other stars should start to become more visible here, and you may be able to see some prominent constellations. If you can move outside of the city limits, your chances of seeing more of the sky will increase. The heavens will open up as you venture into rural areas with undeveloped land. In these environments, the sky will start to resemble astronomical charts and maps. From here, you will begin to see the band of stars that compose our Milky Way and your chance of seeing meteor showers increases. Should you still find yourself cursed with the dreaded light dome, look for areas that are sunk into valleys, or surrounded by a high tree line or hilly terrain. Your sky access may still be compromised, but it may be slightly less affected by the luminous pollution. 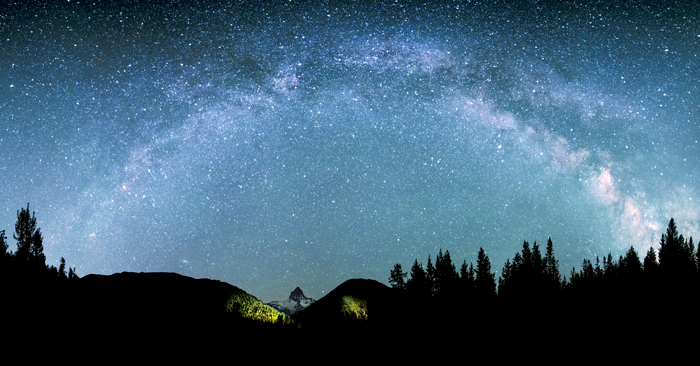 Find the darkest skies in remote areas, far away from any major cities or large populations. Unfortunately, for most of us that means driving a great distance. Consider observing from large county, state, and national parks, which are usually far from city and urban areas. Large parks are often dark by nature, as they are surrounded by expanses of wilderness. Many parks have gone so far as to achieve dark sky status, working to restrict artificial light in and around the area, and providing programs to educate the public about dark sky sites. However, dark sky status is not restricted to parks. The IDA has five different designations for dark sky locations: communities, parks, reserves, sanctuaries, and developments of distinction. Visit our International Dark Sky Places page to learn more about these categories. Our website also provides a resource called Find a Dark Sky Place, where you can search for locations near you that are designated dark sky locations. The IDA website also provides educational resources to learn how to protect our night skies and how to get involved in our organization. If your location meets the criteria, apply for status as a Dark Sky Place. Become a Member and volunteer in various ways on our Get Involved page. Depending on your location, you can either join an existing chapter, or start a new one in your area. Join Our Email List to stay up to date on news and calls to action. Our Useful Links page provides specific resources for areas that are not located near IDA chapters or locations. Use the Light Pollution Map to search by address and see areas color-coded on a darkness scale. Find the best time to stargaze on the Clear Sky Chart, which will give you a 48-hour forecast for sky conditions in your location. With all this information and these tools, you are well prepared for a night under the stars! Help us preserve this opportunity for future generations by advocating for dark skies in your community today.